← A little quilted bag for the mother of Robert’s Russian professor. 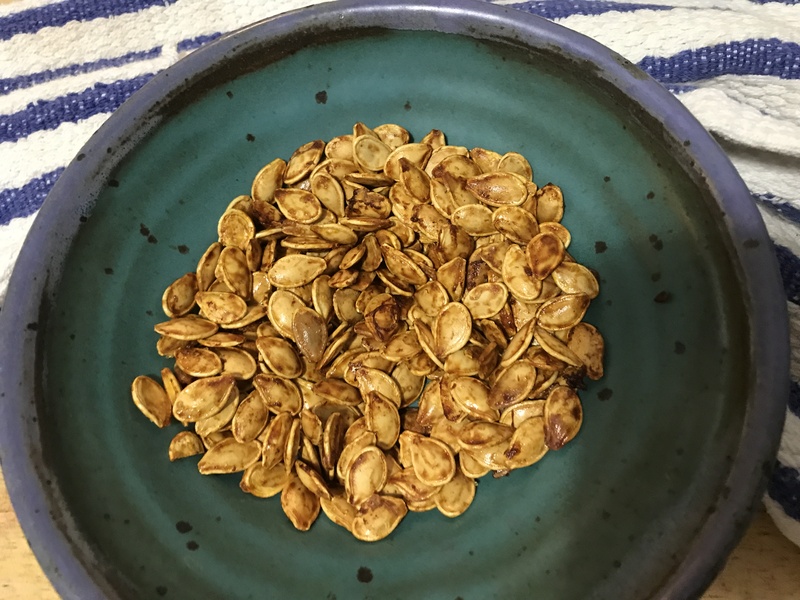 Just a seasonal reminder: if you are roasting seeds from your Halloween pumpkin, you don’t need to clean off all the pulp from every last one. Separating the seeds from the pulp is messy but fun in a visceral sort of way. This is the point at which you don’t have to wash the seeds. You just don’t want large chunks of pulp remaining. So you push the slippery little guys through your fingers until most of the pulp is gone. Toss the seeds with a bit of melted butter, say a tablespoon, or some olive oil. Spread them on a baking sheet, sprinkle them with salt, and roast them at 250° F. for about an hour. You could stir them every 20 minutes or so. I suppose you could sprinkle them with some chili powder or curry powder, but I’ve never done that. I just love the taste of these pumpkin seeds with just butter. The roasted bits of pulp add quite a depth of flavor. Seeds from squash also can be roasted this way. OOOooooo, I can’t wait to get a pumpkin so I use this recipe and the other one for Pumpkin Bran Muffins.